The Combat Information Center (CIC) was the nerve center of the ship. Information from the ship's radars, radios, electronics countermeasures, lookouts, the Bridge and naval gunfire spotters flowed into CIC for evaluation and action. CIC used this information to create a "tactical" picture of friendly and enemy forces in the area in relation to the geographical features. This information was evaluated and reported to the Bridge, Weapons Control, Gun Plot and Flag Plot as appropriate. The diagram at right shows the overall layout of CIC. It is based upon the original blueprints, but things changed with time. I think it is a reasonably accurate depiction of CIC in the early 1970s. The CIC Watch Officer oversaw all CIC operations, and the senior enlisted Watch Supervisor ensured that all necessary equipment was functioning and manned. CIC used radar and reports from lookouts topside to track all vessels in the area. It also maintained a navigation watch of the ship's geographic location to double check the navigation watch on the Bridge. Air Control communicated with friendly aircraft in the area. Detection and Tracking watched for any air contacts within radar range and tracked them. ECM listened for radio and radar signals and identified the type of transmitter and its location. The primary source of information came from radar display consoles. 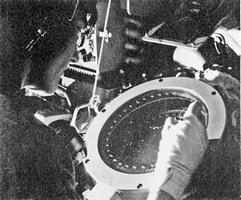 Operators watched these displays for "pips" or spots of light that showed radar signals reflected from ships, aircraft and land features. 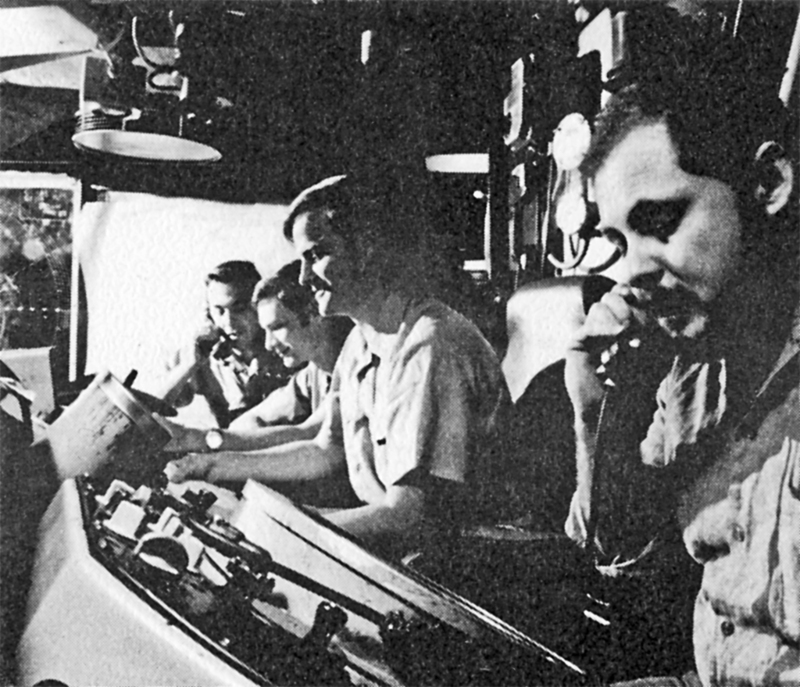 The consoles had illuminated plotter assemblies where the operator could mark contact positions with yellow grease pencils, producing a plot of the contact's movement relative to the ship. Associated with the radar repeaters was an Identification Friend or Foe (IFF) control box that allowed the operator to send an interrogation signal to the contact. If it was a "friendly" it would send back an identification code that appeared on the radar display. The Weapons Control Officer's chair in the Decision and Display Area had the normal US IFF control box on the right arm of the chair, and a Soviet IFF control box on the left arm that caused units of the Soviet Union and its allies to identify themselves. The information that was gathered from all sources was displayed to create an overall picture of what was happening around the ship. Relative plots, with the ship at the center, gave a top down view of the positions of contacts in all directions around the ship. Separate relative plots of surface contacts and air contacts were maintained, and an overall surface/air plot could be created showing positions of all friendly and hostile forces around the ship. Geographic plots showed the position of the ship relative to geographic features on a rectangular coordinate system. The ships longitude and latitude were marked in pencil on paper navigation charts. Positions of shore targets for naval gunfire were also marked on the charts. CIC had a Dead Reckoning Tracer (DRT) that could automatically maintain a geographic plot of the ship's position by moving a pencil across a chart using the ship's course from the gyro compasses and speed through the water from the pitometer, but the position accuracy was subject to errors caused by winds and ocean currents. The ship also had a NAVSAT tracking system on the Bridge that used the Navy's NAVSTAR satellite to determine the ship's true geographic position. It was the earliest "global positioning system" similar to today's GPS, but it had only one satellite that passed overhead to give the ship's position once every 90 minutes. This allowed periodic corrections to the ship's position on navigational charts and the DRT. Lighted boards were used to display information. These had a vertically mounted sheet of Plexiglas surrounded by a frame with lights. 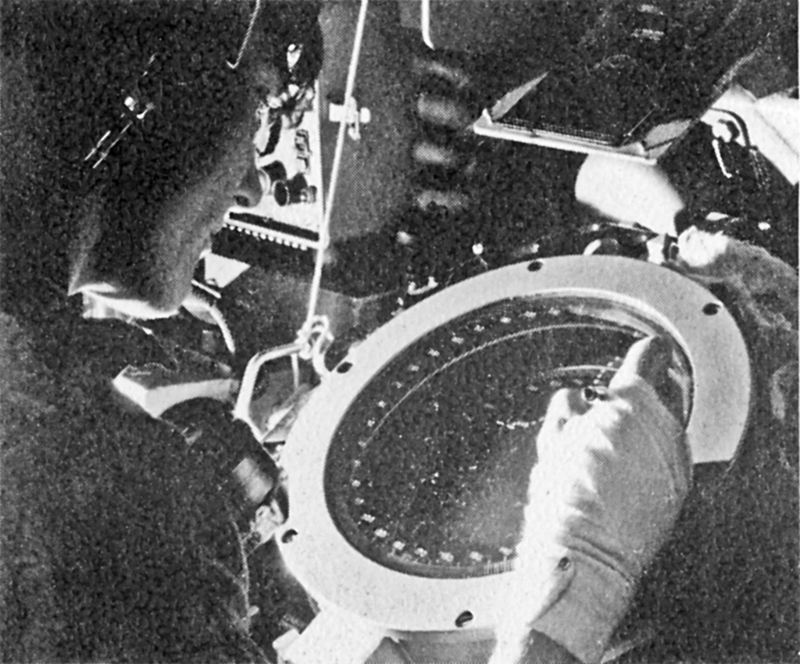 A crewman marked information on the Plexiglas sheet using a yellow grease pencil. Light transferred through the Plexiglas sheet caused the yellow markings to glow, making it easy to see in the dimly lighted space. Plot boards showed the ship's position at the center of a compass rose with the ship's heading at the top. The positions of contacts were plotted as distance and direction relative to the ship's heading, and a line was drawn between successive points for each contact to show the motion of the contact relative to the ship. Status boards had a spreadsheet-like arrangement of rows and columns where text and numerical information could be entered. Information about active contacts was entered on status boards. Information about equipment operational status and maintenance schedules was kept on other status boards. When CIC wanted to pass information to other parts of the ship it used two methods. For normal navigational and surface contact information it used the ship's Interior Communications (IC) system to pass voice messages to the Bridge, Gun Plot and Weapons Control. 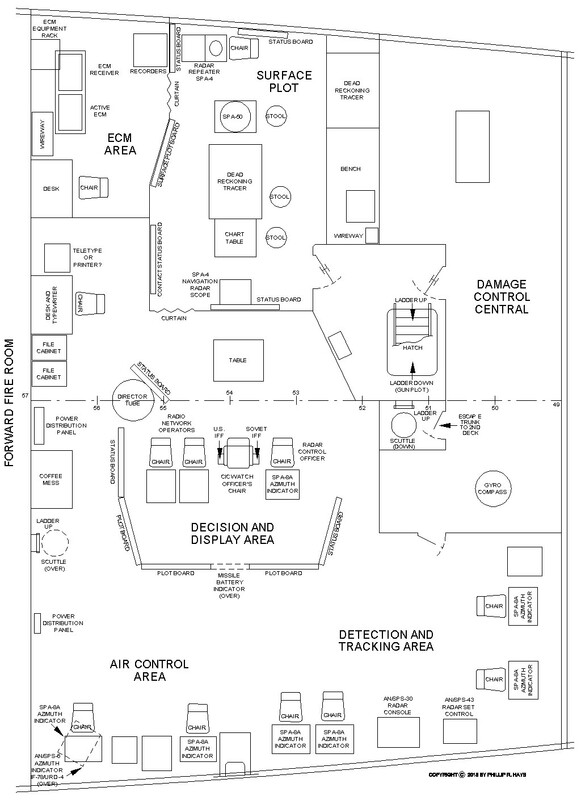 When tracking hostile contacts CIC used television cameras focused upon radar displays that showed active contacts. 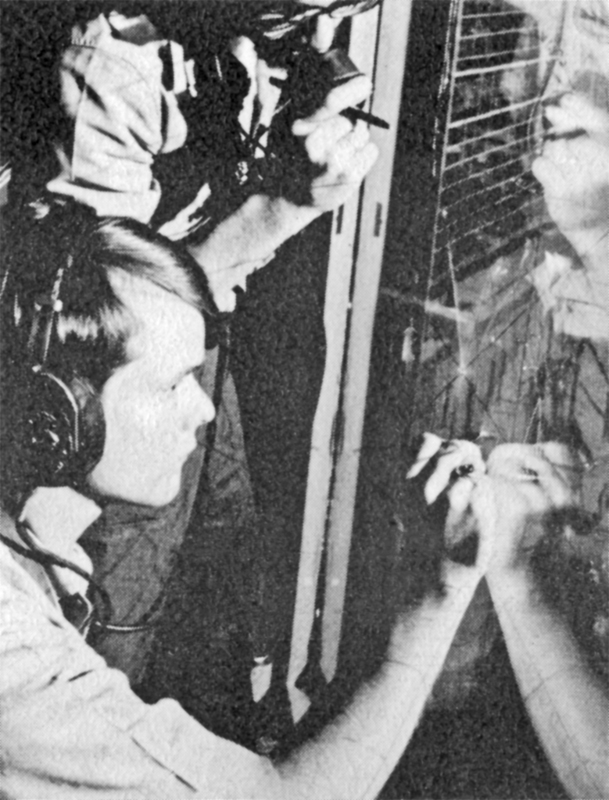 An operator marked target positions with a grease pencil on a lighted tracking head on the radar repeater. The television image was visible on monitors in Weapons Control. An operator at a console in Weapons Control moved a cursor over a specific target on the monitor and pressed a button to designate that contact as a target to be tracked by either the SPG-49 missile target tracking radars or the Mk 37 gun director. CIC contained five areas that were manned according to different states of readiness. The Surface Plot Area was manned at all times when the ship was at sea. 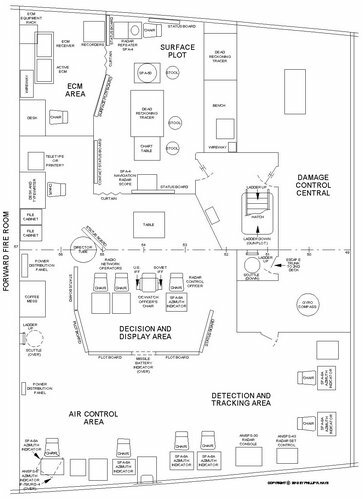 The Electronics Counter Measures (ECM) Area was manned when the ship was in the vicinity of potentially hostile forces, or in other areas of interest. Air Control, Detection and Tracking, and the Decision and Display Areas were manned as necessary to respond to the ship's situation. Only the Surface Plot Area was manned while the ship was free steaming at Condition IV (the lowest state of readiness) between ports and away from hazardous areas. The surface search radar watch was manned continuously and the Bridge and lookouts watched for other vessels and navigation hazards. CIC maintained a navigation plot to double check the navigation watch on the bridge. The Air Control Area was manned during Flight Quarters when the ship was launching and receiving helicopters on the fantail. In locations of interest the ECM watch listened for and tracked electronic emissions from radios and radars in the area. We routinely recorded all emission sources as we passed along the coast of China, Hainan Island and North Vietnam. The ship went to Condition II NGFS, the second highest state of readiness, while conducting naval gunfire support operations (NGFS) in a combat zone. The 5"/38 and 6"/47 gun batteries were manned. The Surface Plot navigation watch, surface search radar, and air search radar watches were manned. A gunnery plot watch under supervision of a Gunnery Liaison Officer plotted targets reported by gunfire spotters ashore or in the air. Target information was passed to Gun Plot to conduct gun fire operations. 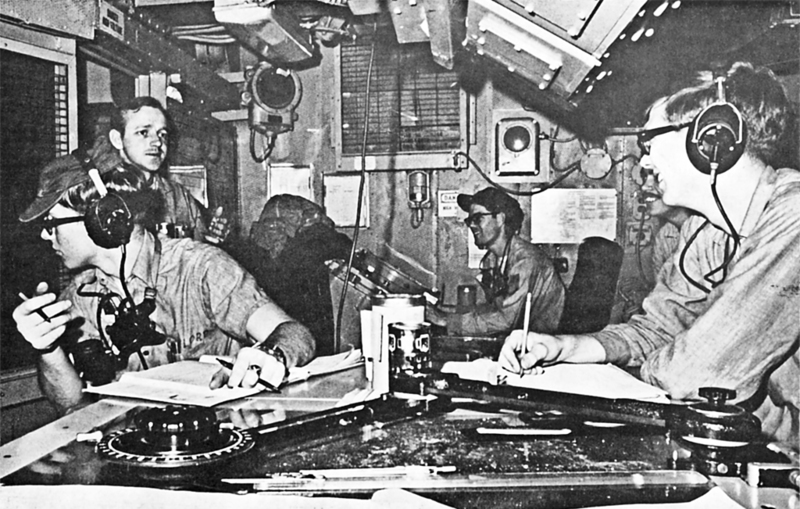 When the ship was at Condition II AAW the Weapons Control station, missile house and 5"/38 dual purpose gun battery were manned. 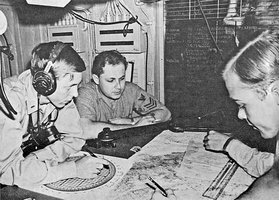 The CIC Surface Plot air search and surface search radars watched for contacts and the ECM watch reported enemy radars and communications. The normal navigation watch was also maintained. The ship was at Condition II AAW when in an area with potential hostile aircraft or missile attack, but no threat was immanent. It was capable of responding to an air or surface attack while the ship was going to General Quarters. Condition I, or General Quarters, was the highest state of readiness. The ship's Operations Department Head served as CIC Watch Officer and supervised CIC from the Decision and Display Area. All weapons systems were fully manned. 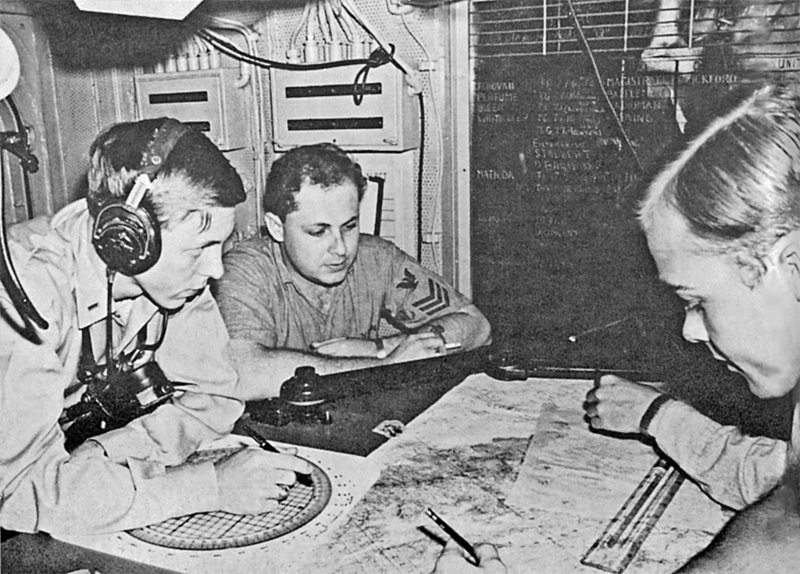 CIC was fully manned with a continuous navigation and air and surface radar watch. CIC Surface Plot, Air Control, Detection and Tracking, ECM and Decision and Display areas were fully manned. All air, surface and shore targets were tracked and evaluated for threats to the ship. Recommendations were made to the bridge, Weapons Control and Gun Plot for engaging hostile targets. Actions against enemy units were coordinated with other friendly ships and aircraft in the area. Air Control could vector friendly Combat Air Patrol aircraft to intercept and attack enemy land, sea and air targets. When the ship was going in and out of port the Condition IV Special Sea and Anchor Detail was set. Line handling and anchor details were set on deck. CIC maintained a close navigation watch using surface search and navigation radars to recommend courses to the Bridge, and to double check the Bridge navigation watch. CIC reported all surface contacts that might pass close to or collide with the OK City and recommended course changes to avoid collisions. Ship's history History of the USS Oklahoma City. Life on the OK City What it was like to serve on the Okie Boat. Photos Pictures of the ship and crew 1969-1972. Awards and decorations OK City awards and decorations. Modeling information Information useful to the ship modeler. Help! A request for information and stories about the OK City. Links Other sites relating to the USS Oklahoma City. Thanks to Harry Bryant, Dennis Jerke, Donald Lee, Doug Rasor and Ron Tracy for helping recall where things were in CIC. Note: Photos are from the ship's Cruise Books.